Housed in a country manor house in the tiny village of Bollezeele, between Dunkerque and St Omer, the Hostellerie Saint Louis offers elegantly furnished rooms and features an excellent restaurant. The rooms at the Hostellerie Saint Louis offer views of the countryside or the charming garden. They feature a private bathroom, TV and telephone. At the gastronomic restaurant you can sample delicious cuisine prepared by owner Philippe Dubreucq. Free parking is provided at the Hostellerie Saint Louis, making it easy to explore the Pas-de-Calais region by car. Local sites include Cassel, Bergues and Gravelines. From Calais: Follow the blue signs for the a16 (in the direction of Dunkerque). Leave the a16 at exit n53, then follow directions to St. Omer d600. After about 5 kilometres, take the d11, in the direction of Looberghe (on your left). 9 kilometres along, you will drive through Drincham. Bollezeele is signposted ahead just before arriving in Erkelsbrugge, turn right on to d226 to Bollezeele. The Hostellerie St. Louis is about 1 mile ahead on the right with two entrances. The reception closes at 22:00 from Monday to Saturday. Please contact the hotel in advance in the case of late arrival. Please note that on Sunday evenings the restaurant is closed and the reception closes at 19:00. On Monday night, the restaurant only serves a 3-course set menu. À la carte is not available on Monday night. 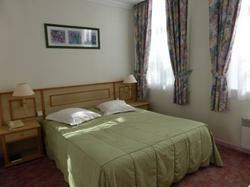 The rooms are en suite and include a TV and a telephone. Rooms are 33 square metres.